Server templates are used to create a set of monitors, alert thresholds, and notification settings across all servers that inherit the template. You can view your current templates by navigating to Settings > Monitoring Templates. You can edit the default templates or make your own. Also you may specify which template is default, this is what will be applied to all new servers at time of agent installation. For both Linux and Window server templates, you will be able to control when and what type of alert will trigger. This will require you assigning a threshold to a monitor. For example, if you set a threshold for an Alert to fire when CPU % reaches 98% or greater after 5 minutes, you will see a Critical Alert. 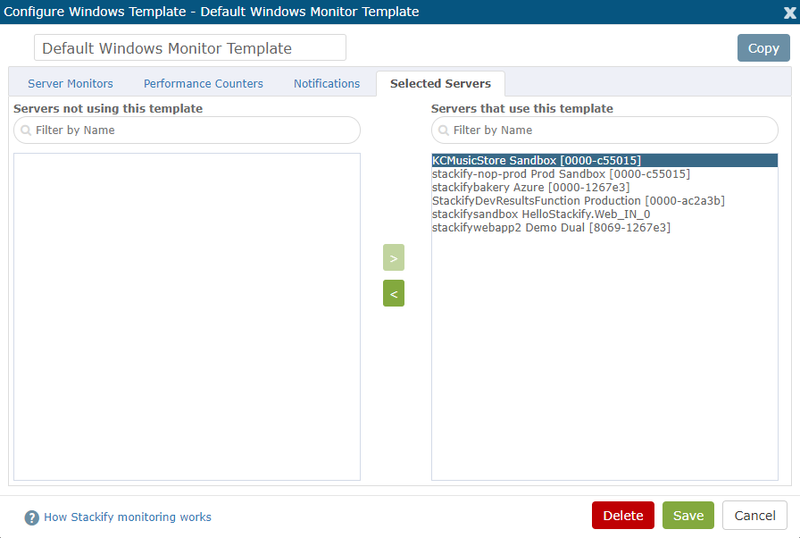 For more information on this, visit the Configuring Your First Monitors page. 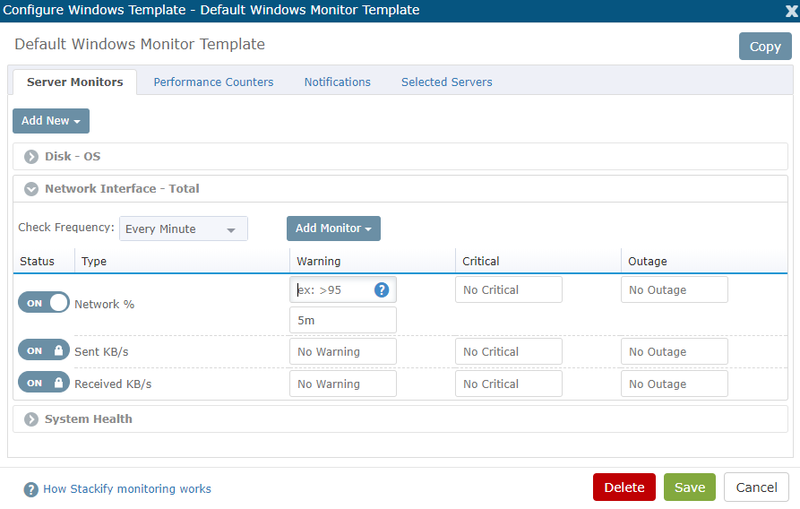 A Server Monitoring Template is broken down into several sections - Server Monitors, Performance Counters/MBeans, Notifications, and the Selected Servers that the template is applied to. Windows templates differ from Linux templates in that they offer Performance Counters as an option to be configured for all servers inheriting the template (Performance Counters don't apply in a Linux environment). From Server Monitors, you can monitor Disk, File, IIS, Network, Processes, and Services by setting thresholds and ranges around these metrics. System Health monitors include Top Processes, Server Availability, CPU, Memory, Agent Health, and (in the event of an Azure Role) Azure Server Status. First, you will select your Performance Counter Category, which dictates what additional choices you need to make for your Performance Counter monitor. It is best to apply more generic server-related monitors, especially if there will be many servers on that template. 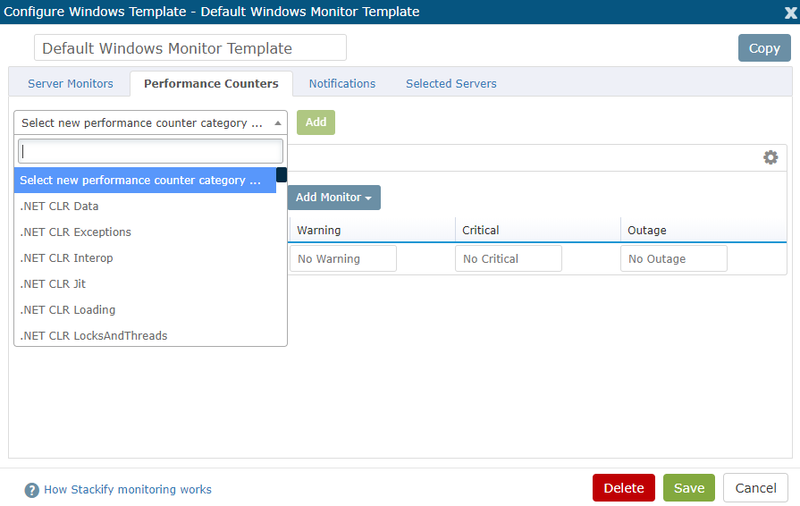 If you apply a specific Performance Counter monitor to be applied by a template, only the servers that counter is available on will report data, while all other servers associated with the template will monitor that will report an error that the Performance Counter is not available. 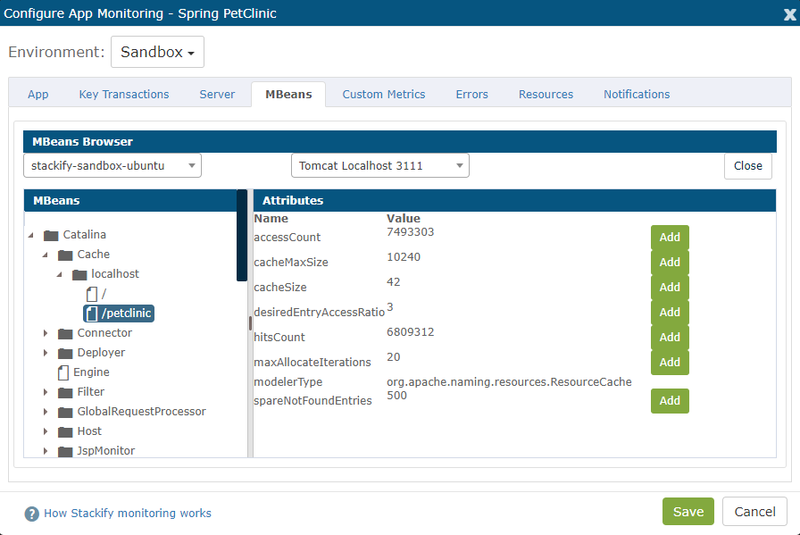 Next, if applicable, you will have to choose the Instance of the Performance Counter to monitor. In the event that you have servers running a Java app server such as Tomcat, you can also add Java MBeans monitors based on a previously configured JMX connection (it's best to configure a localhost connection where possible so that your connection can be used within a template and applied to each server, rather than using a server-specific JMX connection). Notifications can be set for each Server Template. 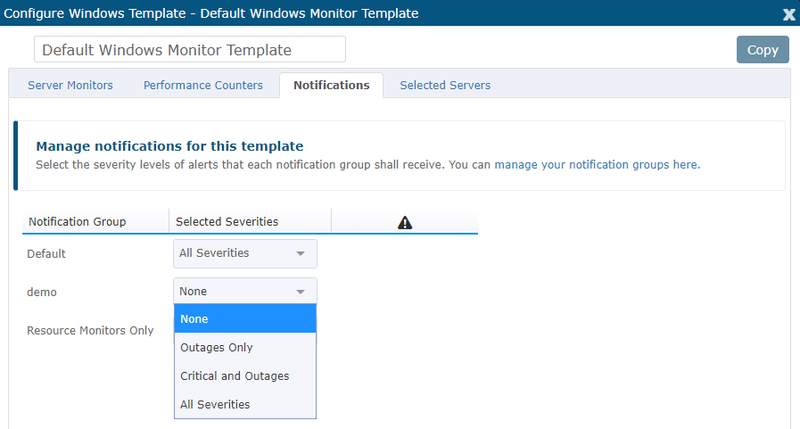 Here you can choose a severity of when a notification group will be alerted. The "Manage Groups" button above will take you to a screen to create a new notification group. For more information see the Setting Up Notification Groups article. In the Selected Servers Tab, you can view which servers are using the selected template. If a server is removed from a template, you will be prompted to associate the server with another template. All servers must be assigned to a template.